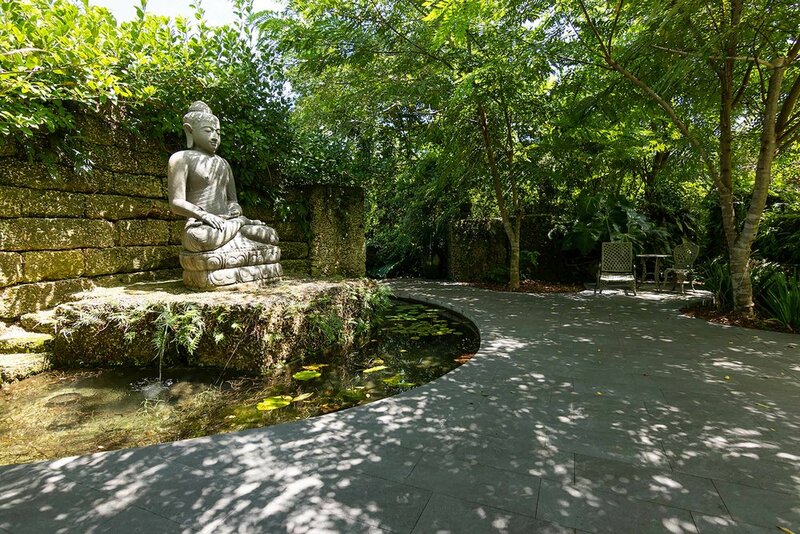 The Zen Garden is located past the patio area and it is our most unique area with both high and low pathways. To enter you must cross over a keystone bridge to a small island platform surrounded by water with koi swimming around you. 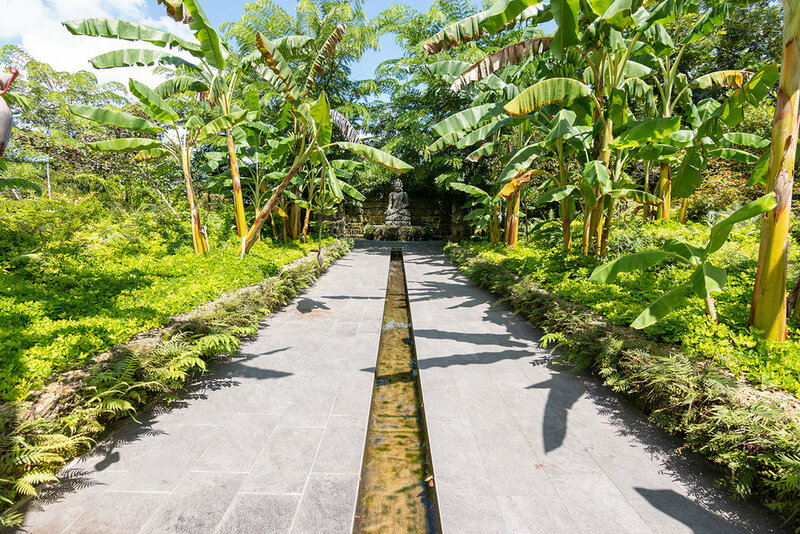 Walking further into the garden, you pass a deep sunken grotto which is accessible by large-scale steps leading 12 feet below the surrounding terrain. Continuing on the path you descend into a pathway surrounded with native ferns on both sides of the passageway. Eventually, you come up to where the water ends with an overlooking statue. Turning to the left you find a circular pond surrounded by a low wall with a bench guarded by two foo dogs. Down the center of this path is a waterway which carries the lifeblood of all nature. At the end of the path, you are greeted by a serene Buddha. 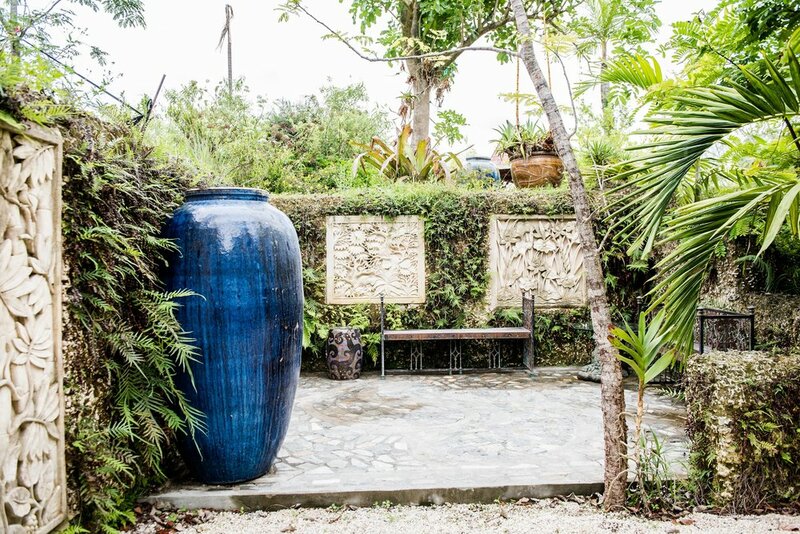 The terraces were created as a sanctuary dedicated to the growth of cacao (chocolate). Cacao trees grow on each garden terrace level with the current banana plants providing interim shade for the young cacao trees until the over-story trees fill in.